Our city's coaches are breaking down. 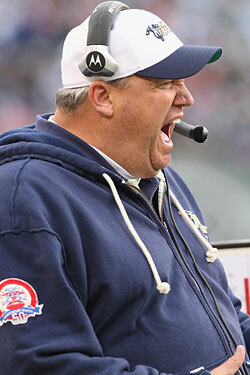 Mike D'Antoni is slowly cracking up, and now it's Rex Ryan's turn. The Jets have lost five of six, firing defensive line coaches and generally falling apart. Ryan is now feeling the strain. Apparently, he's bawling in meetings with players. It happens. After the Allen Iverson debate yesterday, the whole Sports Section staff wept all afternoon, nuzzled into each other's shoulders, looking for solace, for absolution. [Safety Kerry] Rhodes said it was "like seeing your dad cry. You never think you'll see that ... but to see it was surreal. To know that he takes it that much to heart, us losing and us trying to be a winner, it makes you want to keep going." The Daily News interviewed Ryan's dad, Buddy, as well, just to confirm that he, in fact, never cried. You think he's crying now? Wait until after the Patriots game Sunday afternoon in Foxboro. We're crying just thinking about it.